Shiva as Dakshinamurti is the teacher of yoga, music, all arts and sciences and holds the key to the knowledge of spiritual truths. As Dakshinamurthy, Lord Shiva is portrayed as the omniscient young master conveying supreme knowledge, with his right hand raised in the gesture of teaching in silence. Dakshinamurthy means ‘the south facing’ and is the ultimate Guru. Ramana Maharshi has interpreted the name ‘Dakshina Murthy’ as one who is capable but without form. Dakshinamurti is usually depicted as the four-armed deity seated in virasana on a pedestal – the Lord is seated in the 'heroic' posture, his left foot resting on the knee of the pendant right leg, his body straight as the stem of the tree. The right foot rests on a demon symbolically representing ignorance. His uppermost hand holds the flame and cobra or damaru (hourglass drum). He is clad in a short dhoti and adorned with jewelry. His face is always with a benign expression with his hair framing his face. A tree rising behind him and joined by worshipers, who are older than him, at his feet is a usual feature of Dakshinamurti idol. One of the most famous Dakshinamurthy Temples in India is the Vaikom Mahadeva Temple in Kerala. There are also several temples in Tamil Nadu with Dakshinamurthy as the chief deity. Majority of the Shiva Temples also has Dakshinamurthy as a sub-deity. 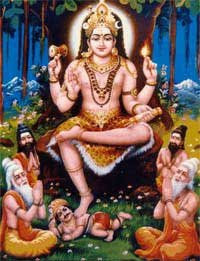 Dakshinamurthy Stotram by Shankaracharya is a popular hymn dedicated to Shiva as Dakshinamurti. Dakshinamurti - Dakshinamurti is one of the aspects of Lord Shiva. 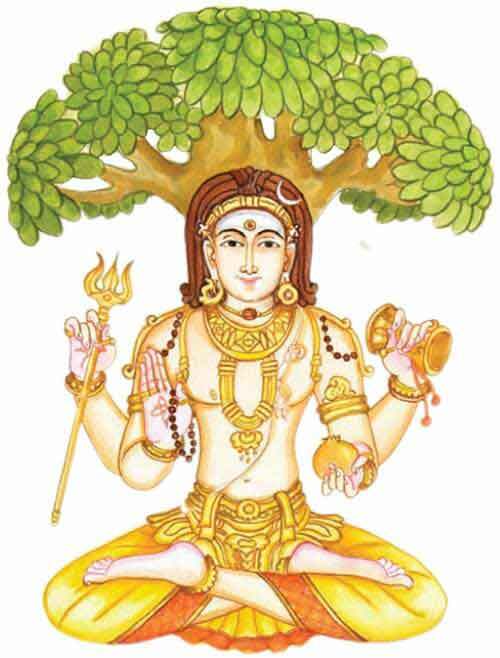 He is usually pictured as sitting in the yoga posture, under a banyan tree, facing the south (dakshina = south) and exhibiting the Chin Mudra, the sign of knowledge, with his fingers. Being the personification of spiritual wisdom, he is the ideal guru. He is also shown as surrounded by disciples, much older in age. Though he is sitting silently, the spiritual power that radiates out of him automatically dispels all the doubts that arise in their minds. The additional verses given at the end of this hymn describe this. Guru - The guru (spiritual preceptor) is one who has realized the Truth himself, and is able to teach about it to others, showing the way. According to the Hindu religious tradition, God is the primary Guru (Adi Guru) who transmits spiritual truths through a succession of human gurus to mankind. It is His power that is actually coursing through the human gurus. Hence, the human guru is often identified with God Himself, at least by his disciples. Awakening - Awakening comes as a result of listening to the mahavakyas (the ‘great sentences’ like tat tvam asi or ‘Thou art That’) from a competent guru after preparing oneself for the same. Second - According to Advaita Vedanta, it is Atman alone that exists and nothing else. The entire world of duality is nothing but an appearance, an illusion. Mirror - The example of reflection in the mirror is limited to explaining the existence of the whole world within the Self. It should not be construed that like the real city outside, which is reflected in the mirror, there is a ‘real’ world ‘outside’ of which the ‘inside’ is only a reflection! The various objects seen in the dream including oneself are all creations of the mind and are within it. Likewise, it is maya that creates this world of duality and all experiences associated with it. On waking, the dream world, which was very much real during the dream experience, disappears. Similarly, this world experience of the waking state also disappears when the spiritual awakening comes.